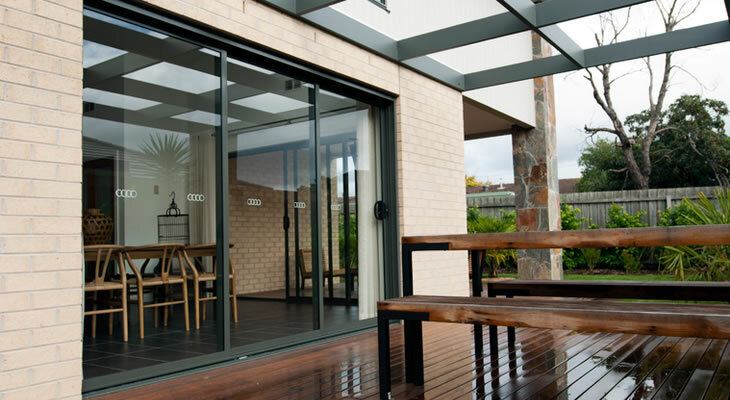 Sliding Doors are a great way to open up any area within your home – bedroom, alfresco, or dining. Our doors are furnished with quality trouble free door rollers and key-alike deadlock handle – for your peace of mind. We can fit a standard flydoor or our SupaScreen stainless steel security door for the No 1 choice in security. Our sliding doors come in 2, 3 or 4 panels and can accommodate widths of up to 4.8 metres and heights to 2.4 metres. The wide range of combinations means you fit these into any room, thereby allowing light in and making your room appear larger and brighter. Stearne’s can custom make your sliding door to meet your requirements.